We live in a climate where winters can be deadly without adequate heat and shelter. Concerned about the ability of our family to survive without heat, we turned off our heat in the middle of January just to see if we could survive the freezing temperatures. Learn more about our adventure here. Living without power taught us many valuable lessons. How will you survive if your power goes out in the dead of winter? A little bit of advance preparation can make a difference. We want to share with you the devices we recommend for emergency heating. We have confidence that with adequate fuel storage, we can survive freezing temperatures and thrive when challenges knock on our door. Please, please use great caution when burning anything indoors. Carbon monoxide is a dangerous enemy. Do not put the safety of your family in jeopardy! Practice with your chosen heating devices so you are ready to safely use them when disaster strikes. Make it fun and enjoy life! Alcohol is a great storage fuel and can be safe to use indoors. The alcohol heater we recommend is the ORIGO Heat Pal 5100. 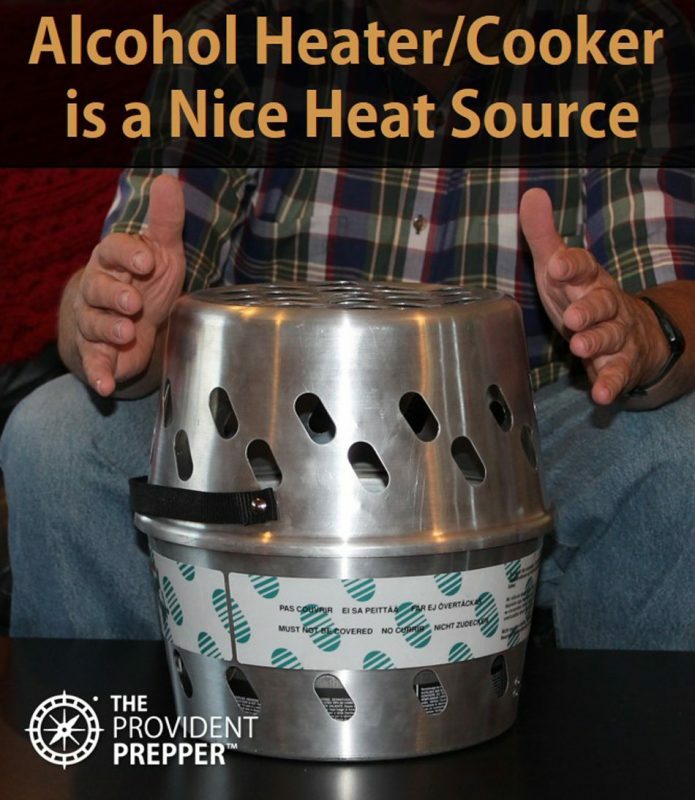 It is a marine device that doubles as a heater and a cooker, making it quite valuable in an emergency. The manufacturer recommends burning denatured alcohol, which is a nice clean fuel. Click here to learn more about how to safely store fuel for emergencies. The Heat Pal will provide 5,200 BTU (1500 Watt) for up to 5 hours on one quart of denatured alcohol. It takes about 10 minutes to bring a quart of water to a boil. The Heat Pal is small and lightweight. It measures roughly 12″ x 12″ and weighs about 5 pounds. The size makes it easy to store and a good candidate for emergency evacuation. If you plan to use the Heat Pal when you “bug out”, I would purchase fuel in one quart containers. Larger 5 gallon containers of denatured alcohol are awkward and heavy. They may be appropriate for home fuel storage, but the quart containers will allow you the flexibility to take as many as your mode of transportation will allow. One thing that I really like about the Heat Pal 5100 is the base of the device remains cool. It can be safely placed on a variety of surfaces. Notice in the photos that it is sitting directly on the table and on a cotton tablecloth in the one with the kids playing cards. 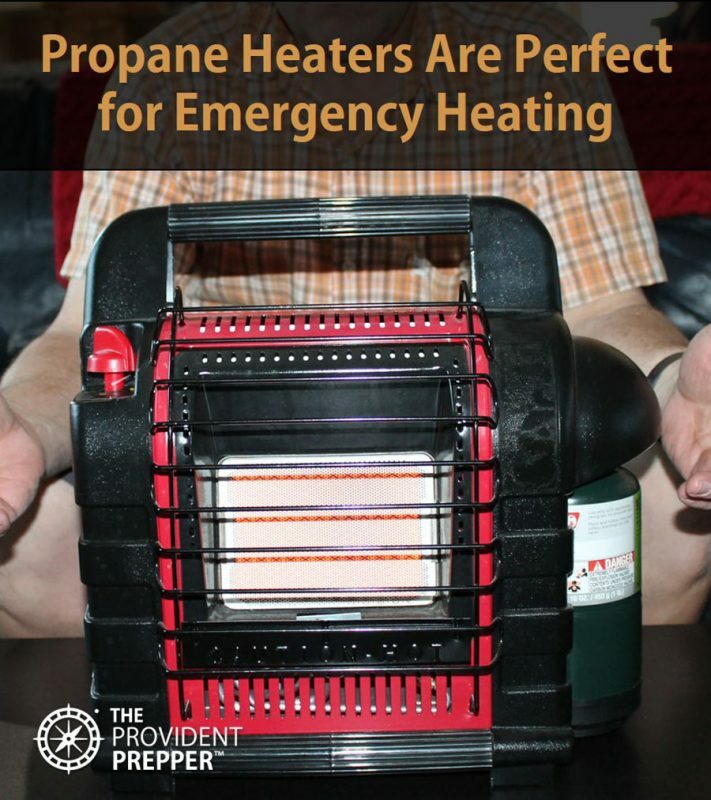 Portable propane heaters are an incredible asset everyday as well as in emergency situations. Recently I was freezing while watching my son play in a high school football game. I was green with envy as I noticed a couple in the stands basking in the warmth of a Mr. Buddy Heater. I should have thought of that! Not all propane heaters are rated for indoor use. It is critically important that you only use heating devices which are rated for indoor use inside your home. Just plan ahead and purchase the right device and store the fuel safely. Mr. Heater makes our favorite propane heaters. There are several different sizes which are uniquely suited for individual preferences and needs. Little Buddy Heater is a small radiant heater fueled by a 1 pound propane cylinder. It is a good size for a tent or bathroom. It produces 3,800 BTU and can heat up to 95 sq. ft. for 5 ½ hours on a 1 pound cylinder. Portable Buddy Heater my favorite and can put out 4,000-9,000 BTU, heating up to 225 sq. feet. A 1 pound propane cylinder will provide 3 hours on high and 6 hours on low. A swivel regulator enables it to adapt with a propane hose to a remote supply of propane. We connect ours to a 20 pound propane tank outside the window of the house. Hunting Buddy Portable Heater is a little larger and produces 6,000-12,000 BTU heating up to 300 sq. feet. It is fueled by a one pound propane cylinder or can be adapted to use a remote gas supply with a single hose and filter. Big Buddy Portable Heater is the largest producing a whopping 4,000-18,000 BTU, heating up to 450 sq. feet. It is fueled by two 1 pound propane cylinders or may be adapted to use a remote gas supply with a single hose and filter. The Big Buddy has an integrated fan which requires 4-D batteries or an adapter. Remember to store plenty of D batteries if you plan to use this heater when the power is out. Alternatively you might want to use a battery back-up and an adapter. 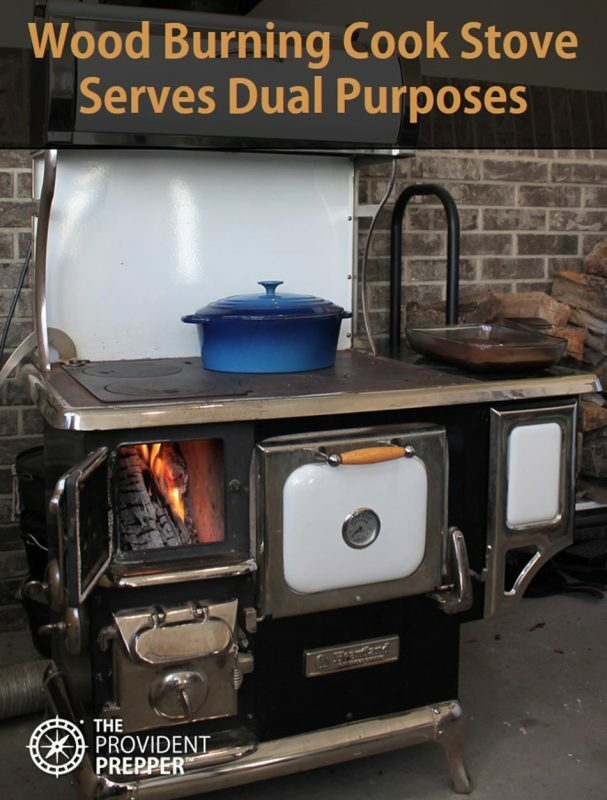 If you have read much of our writing, you know how much I love our wood burning cook stove. It is mid-November as I write this resource and a roaring fire takes the chill off our home, creating a homey atmosphere. I whipped up a batch of brownies to slide in that oven so when the kids come home from school they will be met with the smell of delicious warm chocolate and an inviting fire today. Warm winter memories surround our wood burning stove. Imagine how comforting the wood burning stove might be when disaster strikes. Not only does it meet the minimum requirements of keeping everyone from freezing, but the comforting memories will ease the stress associated with the emergency. It is important to keep a generous woodpile ready for use. We store enough wood for several years to ensure we will have enough seasoned wood to outlast a crisis and to be able to share with our neighbors. A fireplace log storage rack is an important tool to ensure you always have enough dry wood inside to start the fire. Be prepared with a heat resistant bucket to store the hot ashes. Keep an extra gasket replacement kit on hand to ensure you don’t have smoke and toxins leaking out of the stove. A heat powered stove fan is an effective way to get the warm air to circulating the room quickly. It makes a big difference! If a wood burning stove is an option for your situation, we highly recommend purchasing one. It is one of the best investments we have made for self-reliance and emergency preparedness. 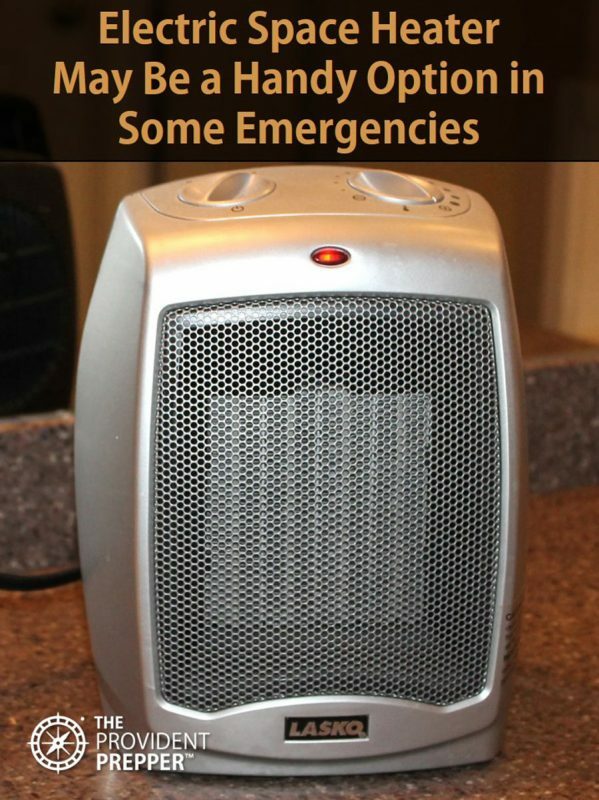 An electric space heater is definitely not the first thing that comes to mind when developing an emergency heating plan. However, there are a couple of good reasons you might want to have at least one good electric space heater around the house. There may be times when you have a limited amount of power during the time when a generator is running and can use the little heater to provide localized warmth. Another scenario is that you may have power, but no natural gas to run a furnace. An electric space heater could make a big difference if your furnace fails. Electric space heaters are available in a variety of sizes. The heater in the photo to the right is my personal heater, the Lasko Ceramic Portable Space Heater. This 1500 Watt heater is under my desk right now warming my feet and making me very happy. Lasko also makes a MyHeat Personal 200 Watt Space Heater. It is very small and draws only a very small amount of power. Another option might be a Oscillating Ceramic Tower Heater. It takes up more space but has the ability to heat up a larger area. At 1500 Watts it produces significantly more heat than the personal space heater. Consider how you might benefit from having a space heater, or two, available when you need them. Safety must always be at the top of your list when it comes to emergency preparedness. It would be a tragedy to work so hard to be prepared to take care of your family, only to have someone injured because the correct precautions were neglected. We recommend that you have fire extinguishers mounted in permanent locations to ensure everyone knows where they are and they are ready to go in the event of a fire. Placing them in a cupboard or closet may waste valuable time searching for the extinguisher when it is need. Fire spreads quickly! Our fire extinguishers are kept in recessed fire extinguisher cabinets. 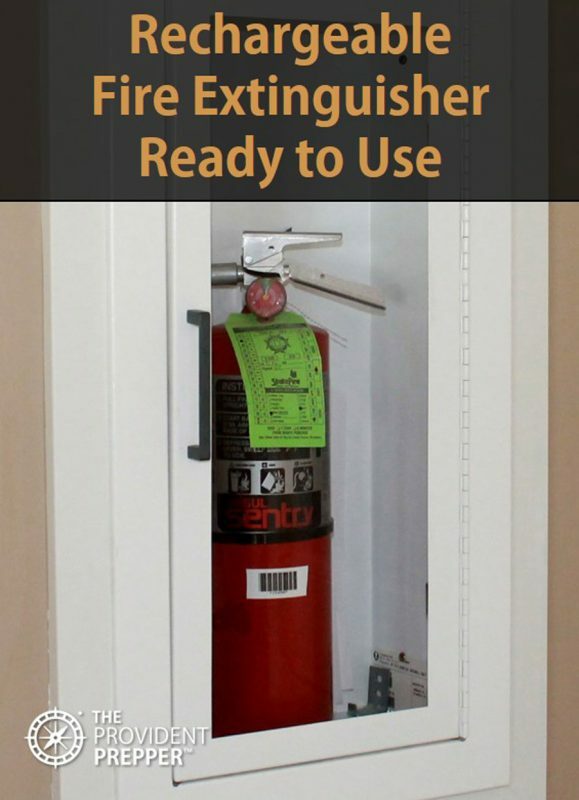 They are easy to install and store the extinguisher out of the way, but close-by when needed. It is also a convenient place to store a hard copy of our family fire escape plan. We have one cabinet in the kitchen behind the door coming in from the garage (pictured). It is strategically located within 15 feet of both the kitchen and the wood burning stove. Cabinets with extinguishers are also located in the garage and in the basement. It is better to have them and not need them, than to need an extinguisher and not have it. Purchase rechargeable dry chemical fire extinguishers rated for class A, B and C fires. That will cover the most common fires. You simply take the fire extinguisher to your local fire department to have it recharged for a small fee. If they don’t recharge them, they will direct you to a local business that can. I personally avoid disposable fire extinguishers. They aren’t as quite as powerful and will last between 5 and 15 years depending on the variety you purchase. We prefer the rechargeable fire extinguishers. The next safety item is smoke and carbon monoxide detectors. Make sure the smoke detectors in your home are working and have fresh batteries. You may want to install the lithium batteries for smoke and carbon monoxide detectors which are designed to last for 10 years. In addition to the installed detectors, purchase carbon monoxide detectors that have digital readouts which will enable you to monitor CO levels as they rise. We have a couple of portable carbon monoxide detectors we set out whenever we are burning anything in an enclosed area … just to be safe. We hope these recommendations are helpful to you. We have spent hundreds of hours researching, experimenting and actually living the provident life. Hopefully, you will benefit from our mistakes as well as our successes. Unless you live in a very mild climate, the cold weather can be a formidable enemy to your survival. Planning for a loss of natural gas and/or electricity just makes sense. Be sure to store fuel for your emergency heating devices or the heaters will not do you any good at all. And most importantly, be safe!